1) Jeffrey Lebowski is referred to in The Big Lebowski by which of the following names? 2) Whom plays the cowboy stranger that talks to Jeffrey Lebowski in the bowling alley? 3) Maude's friend Knox Harrington works at which of the following occupations? 4) Jeffrey's friend Walter won't bowl on Sundays because he is which of the following? 5) The Nihilists order what for breakfast at the diner? 6) Which of the following is the name of the bowler shown in this photo? 7) How much money do The Nihilists expect as a ransom payment for Bunny Lebowski? 8) The Dude and Walter believe that a teenager named ______ has stolen the briefcase with the ransom money. 9) What did Donny die from in The Big Lebowski? 10) Which drink does Jeffrey Lebowski prefer in The Big Lebowski? 11) Which of the following actors played the cowboy stranger at the bar that speaks to Jeff Lebowski? 12) Which of the following adjectives best describes Jeffrey in The Big Lebowski? 13) Which of the following characters pees on Jeffrey Lebowski's rug in The Big Lebowski? 14) What is the name of the personal assistant to the "Big Lebowski"? 15) Walter Sobchak in The Big Lebowski is a veteran from which of the following wars? 16) What job did "The Dude" have in The Big Lebowski? 17) Jackie Treehorn works in which of the following industries in The Big Lebowski? 18) Mr. Lebowski received a key to which city in The Big Lebowski for his philanthropic work? 19) "The Big Lebowski" has physical problems with which of the following? 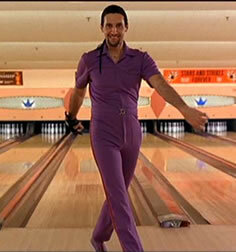 20) In The Big Lebowski Smokey reports Walter to the Bowling League for which reason? 21) How old is Larry Sellers? 22) Where did Walter and Jeff spread Donnies ashes? 23) Which actor plays Donny? 24) When does the story in The Big Lebowski take place? 25) Which adjective accurately describes the BIG Lebowski? 26) What type of dog does Walter take to the bowling alley? 27) How much money does Maude offer Jeff Lebowski to recover the money? 28) The sherrif from which town tells Jeff Lebowski to stay out? 29) Whom is a pacifist? 30) Which actor plays Donny? 31) Maude asks Jeff Lebowski if he likes ____? 32) Maude works as a professional ___ in The Big Lebowski? 33) Which of the following actresses played the character Bunny Lebowski?